Discussion in '"Boat Anchor" & Classic Equipment' started by KL7AJ, Sep 13, 2018. Besides accumulating boat anchors (and distributing them to unwitting victims, occasionally), I've had some really interesting test equipment come through the shack. Probably the most interesting was an antique Varley bridge, used by phone companies to locate wire faults decades before TDR sets. (And with surprising accuracy, by the way). Another gem was a standard battery cell.....sort of like two Florence flasks with a glass tube running between them to generate a precise reference voltage....if you inserted the right potions into the flasks. I've had a number of nice wood cased bridges come through...as well as a Leeds n Northrop resistance decade. Also a whole set of General Radio wavemeters. I've recently become somewhat of an instrumentation nerd...doing a lot of reading on how folks did accurate measurements of ANY kind with some surprisingly crude instruments. It's also amazing what hams were able to do with NO instrumentation.....other than perhaps an RF ammeter. I never pass up anything that resembles a piece of test equipment.....I like to use the stuff in my electronics classes....makes the kiddies appreciate digital o-scopes and DMMs all the more. What's in YOUR wallet? I worked for HP for nearly 25 years but I have gravitated to the old GR's in my personal collection. The oldest GR unit I have is an AC voltmeter (Type 726) (from KC2VER) from the 30's and youngest is the GR-1608-A (from WA2WEJ) from the 60's. I don't go out of my way to collect GR but a lot shows up at hamfests and it is hard to pass up and usually for very little money. The general rule going forward is to only obtain units that I can actually put to good use for radio related measurements! As for HP, I have at least a few audio oscillators that were based on HP's first product. The oldest I have is the HP 200I (yes, an "I"...not a typo) which I think is from the mid 40's or so. Then I have some old BRC Q meters. HP bought BRC and I have a 250RX meter with the HP logo and the HP paint scheme (BRC's were black crinkle). I can go on and on and my collection is nothing compared to what die-hard collectors have! The oldest complete test equipment units that I have are from the 1930s. Somewhere, I have things like individual meter movements from earlier but for complete units, the 1930s. In addition, I have an RCA TMV-97-C from 1935 that was used like the BC-221 and LM- units as a signal generator, frequency standard, and receiver. I also have several units from the 1940s and 1950s that were used in the commercial two-way radio arena like a couple of Lampkin 105B frequency standards, a Lampkin 205 deviation meter, Hewlett-Packard audio generators and signal generator, Boonton r.f. 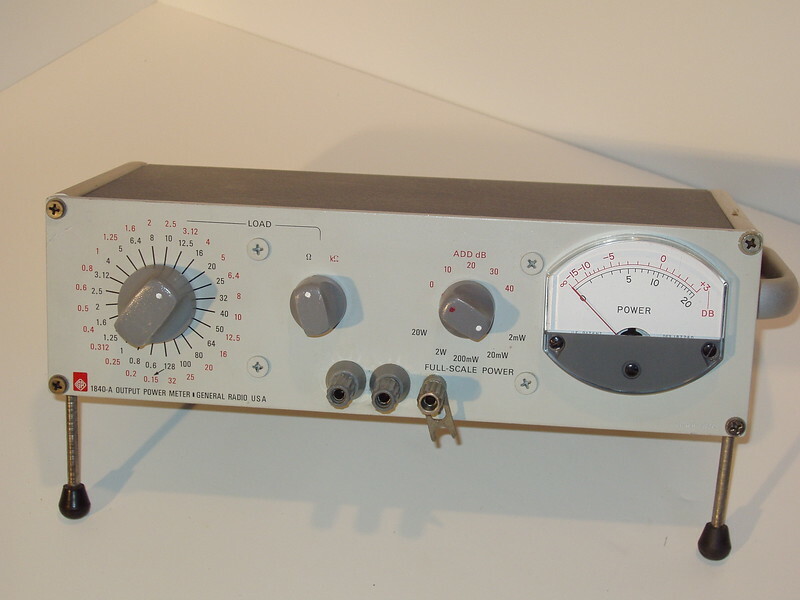 voltmeter, Measurements 80 / TS-497B signal generator, Measurements 59 GDO, etc. Of course, I have much newer test equipment. But, there are occasions where using certain examples of the older equipment actually work better than the newer units. I really enjoy putting old test equipment into shape and using it while working on the vintage rigs. I happen to think much of this equipment is quite attrative to look at, and I'm looking forward to soon having a bench large enough to keep most of these things out where I can use and enjoy them. HP410B. Just be aware that the common is grounded to the three prong plug and if you attempt to measure a voltage drop across a resistor--bad things can happen. You sure start a lot of fun and interesting threads. I had many good university and industry instructors over many years. A few were like you. Most of those crazies became close friends and decades-long mentors. One of the most fun and totally irreverent was Kenny Johnson, K6FU (SK). Instructor enthusiasm and "the unusual" that directly related to real life was so much more important than all the theories and never-remembered equations. I was a math/physics major in college. 50+ years later I still believe that I learned my advanced math in my science classes -- not in the math classes. It was due to enthusiastic instructors who could relate the math and physics. I have a standard cell. It is so old it may not be akkurate. Here is the last version of the GR-583, the 1840-A. GR made a lot of excellent test equipment for decades, and although now considered ancient, most can easily be made quite serviceable, retaining the original accuracy.